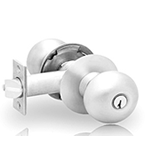 The Sargent 8 Line Door Knob Lockset- Entry-Office bored in lock provides superior strength and durability for high traffic applications due to their true interlocking between the lock body and the latch. Key outside retracts latch always. Button inside can be pushed-in & turned only. Button inside pushed-in and turned, locks outside knob until released manually. Knob inside always retracts latchbolt.